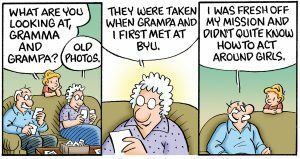 Didn’t know your favorite old folks were BYU alumni? 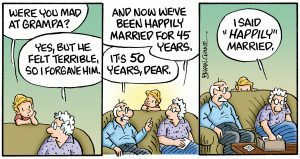 Well, their creator, nationally syndicated Pickles cartoonist Brian Crane (BA ’73), is a grad. 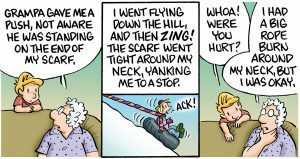 As with many of his strips, this how-Earl-met-Opal backstory is largely autobiographical, based on Crane’s own experience courting his wife, Diana Long Crane (BS ’73), while a student at BYU. Throughout 2019 BYU Magazine will be sharing campus stories through the drawings of artistic alumni—cartoonists, graphic novelists, and others. 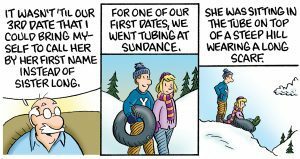 Want to pitch your own artistic BYU memory? Send your concept to magazine@byu.edu. Through the good, the bad, and the funny, this missionary kept her mission journal as a 628-page comic strip.